I enjoy the four seasons we have here in the Upper Midwest. There is value to slowing down in the winter. By March, however, the Wisconsin winter becomes a bit tedious. I start to long for the farmers’ markets of the other three seasons with their supply of fresh vegetables and fruits. How appropriate, however, that it is those vegetables that have spent the longest time in, and under, the ground, and that store well all winter that can rescue us. Flavor can be coaxed from seemingly routine vegetables like carrots, potatoes, carrots, onions, and sweet potatoes and many other root vegetables by oven roasting them. Adding cauliflower to the mix provides texture and flavor variety. They are then ready to be used in several solo meals, lunch or dinner. You’ll need a large mixing bowl to toss the chopped veggies with olive oil, a baking sheet pan or roasting pan with sides and your chef knife, cutting board and vegetable peeler. Purchase the veggies of your choice. Here’s a good start. Preheat oven to 425 degrees. Prepare vegetables by cutting each into a chunky medium dice. Each should be roughly the same size as the other, but don’t worry if they are not exact. Round items will often have a few odd shaped pieces. Keep the chopped cauliflower set aside separately. Cut the carrots on a slight angle to achieve a wider surface to roast. The sweet potato must be peeled but the Idaho potato does not as long as it is washed well. Large items like the potatoes and the onion will require a horizontal cut through the entire item to have a piece the proper size to dice. It is also much easier to work with that piece that is flat on the cutting board than trying to dice something that is round. Put all the vegetables in the mixing bowl, except the cauliflower, and drizzle olive oil. Toss to combine so chunks are lightly coated. I don’t mind tossing the veggies and oil with my hands. My hands are so dry by the end of winter that the oil feels soothing to my skin! Lay the chopped veggies out, in a single layer on a baking tray or roasting pan with sides. Place in preheated 425 degree oven for 15 minutes. Meanwhile, put cauliflower pieces in the mixing bowl and toss with olive oil. Pull tray from oven and add cauliflower to other vegetables. Return to oven for 12 additional minutes. Remove tray and test various pieces with a fork to make sure they are done, especially potato and sweet potato. Return to mixing bowl to cool and lightly sprinkle with coarse sea salt. Here is an opportunity for the finesse of eating solo. Various seasonings could be added such as cumin and chili powder or a Greek or Mediterranean blend with oregano and lemon or a dash of paprika or Old Bay seasoning would suit them well. I drizzled a little apple cider vinegar into this batch for some zip. The roasted vegetables can be used as a side dish for dinner, can serve as a sort of potato salad for lunch when combined with a slight bit of mayo and mustard or they can provide the basis for a quick batch of soup or stew with that handy box of chicken stock that you hopefully always have on hand. Once you know this technique, you can start adding in other root vegetables for even more flavor variety. Try parsnips, rutabaga, turnips or celery root, also called celeriac. Each one has a distinct flavor, a parsnip is essentially a white carrot but earthier. The value of winter are the indoor activities like reading, writing, and yes, cooking that can help us open up new ideas that we can incorporate into future routines. Solo meals are not just eaten by those who live as singles but can often be a part of the busy school and work days of families or roommates. The busy holiday season, with school concerts or exams, office get-togethers and gift shopping, can make for more solo meals, as well. What are often seen as seasonal ingredients on holiday tables can be tasty additions to solo meals. The warmth of the oven in these short, dark winter days is beneficial when preparing winter vegetables like one of my favorites, butternut squash. It is far more versatile than as a mashed side dish. It can be diced into a vegetable hash and served with eggs, chicken, or a pork chop or in a steaming bowl of stew. Or, roasted, diced squash can be a healthful addition to a chilled salad with options such as a rice blend, simple vinaigrette and a dried fruit. Learning about an ingredient’s origins can be helpful in choosing its preparation partners and seasonings. Squash is one of the true Native American crops that geographically extend from South to North America. It is one of the earliest plants to be farmed. Squash evolved into such an important part of many Native American diets that it became part of the “three sisters” which include squash, green beans and corn. Agriculturally, planting the tall corn provided support for the beans on their climbing vines. The squash, growing on vines but laying on the ground, kept weeds down and kept water from evaporating. Orange vegetables, like squash, are packed with vitamin A and C. It can aid in strengthening the immune system and provide anti-oxidant help. Nutritionally, the “three sisters” provide complete nutrition. These three vegetables enjoy being together from the ground to the plate. Squash, corn and beans can be the components for a stew or soup, either vegetarian or with chicken stock. Squash can be roasted in the oven to highlight its hearty, dense flavor. Preheat your oven on to 375 degrees. Using your chef knife (see previous post titled “Three Essential Knives”), chop off the top and bottom ends. Cut into two pieces by chopping the thinner neck from the fatter bulb area. Use a sharp peeler or knife to remove the thick skin. Then, stand the squash pieces so it is standing on one of the flat ends. Cut the neck portion into slices that are about 1/2 to 3/4 inch thick. Then, dice these pieces into cubes. The size of the dice will depend on your preference and on the end use. Next, stand the peeled bulb piece and cut in half. With a large spoon, remove the seeds. Again, stand the piece up and slice into pieces the same width as the slices from the neck piece. Dice into same size. Because the bulb is rounded, the diced pieces will not be exactly the same. Dice as close to the same size as you are able. Put diced squash in a large mixing bowl and toss lightly with a vegetable oil, either neutral oil like canola oil or a flavorful olive oil will work. Spread onto a baking sheet and place in the hot oven. The smaller the dice, the quicker they will roast. Check after 15 minutes. Use a fork to test doneness. Roast a bit more, if needed. Squash pieces should be tender to the center but still firm enough to hold its shape. Part of the roasted squash, especially the uneven dice from the bulb piece, could be mashed with butter or oil, a bit of salt and even a dash of chili powder or chipotle pepper powder. Mashed squash can be easily frozen in an airtight container, after it is thoroughly cooled off. The remaining diced squash can be tossed with bottled vinaigrette, cooked rice, particularly a hearty wild rice blend, chopped nuts and dried fruit, like a dried cranberry for a satisfying and healthful to-go lunch. A few weeks ago when my sinuses were congested, my eyes were puffy and my head was simply stuffed up, I knew I needed some brothy chicken soup as part of my recovery. The process of making soup shows how a thoughtfully stocked kitchen and the will to improvise a few steps can result in satisfying solo meals, thus the craft and finesse of eating solo. Cooking for one has forced me to dissect recipes to their essential fragments and reconfigure them to edible elements that are friendly to eating solo. The goal becomes making enough for one or two meals and, ideally, using items I have on hand and preparing ingredients that become parts of meals. Chicken: I enjoy the fuller flavor of dark meat, especially for soup and stews, but if you prefer chicken breast that is perfectly fine. I shop at the meat counter and buy a pound of boneless, skinless thighs. Olive oil or canola oil: Both are good items to have on your shelf. Chicken broth: The 32 ounce boxes of chicken broth have a long shelf life, of many months, so are useful to have on your shelf. Even for a small batch, I would use two boxes since I like lots of broth. Noodles, potato, or rice: For this batch, I chopped some noodles, about 3 ounces, which I had purchased on sale from the local fresh pasta maker. I cooked them first in the 3 quart pot that I would be use for soup making, following the package instructions. Otherwise you can use a diced, baked potato or rice that you had from the previous day’s stir fry. Frozen vegetable: Yes, I enjoy fresh veggies, but a 10 ounce bag of frozen veggie is a quick fill in. California Blend includes broccoli, cauliflower, and carrots. Dry seasonings: Dehydrated onion, garlic, celery, dried seasoning such as thyme or basil and salt and pepper are useful. To assemble quick chicken soup, all you should need to cook is the chicken. The noodles or other starch will be pre-cooked, and the chicken broth, frozen vegetables and seasonings will be on hand. Be aware that chopping fresh chicken or other meat is a potentially hazardous kitchen task and needs to be cleaned up with soap and water right away. Never cut anything, like vegetables, on the cutting board after raw meat. Be sure to thoroughly wash your hands and counter top with soap and water too. Dice your chicken small enough so it will fit on a soup spoon. Drizzle 3 tablespoons of olive oil into the bottom of your soup pot. Put the pot on burner with the heat turned to medium high. When the oil is warmed, drop chicken pieces into pot (then wash your hands with soap). Stir with a large spoon until chicken is cooked through. Remove chicken from the pot, when it is firm, but leave the oil and chicken bits in the bottom. Return pot to burner. Keep burner on medium high heat and gradually add chicken broth. Use spoon to loosen bits of chicken on bottom. Add frozen veggies, cooked chicken, noodles (or potatoes or rice), stir and heat through. Cautiously add your choice of seasonings, start with a teaspoon of each. You can always add more but it is impossible to remove it. Stir well and simmer on medium to low heat. A few bubbles are fine but don’t let it boil. Taste and add seasonings, if needed. 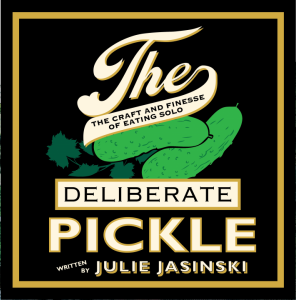 Crafting Meals on The Deliberate Pickle blog will often involve this interwoven process of using ingredients in multiple ways. A major frustration in cooking solo can be following recipes that are built for four or more servings, thus producing too much food and wasted leftovers. After two bowls of chicken soup and the nasal decongestant spray the pharmacist recommended, I certainly felt less in a stuffy fog and healed. I had some soup left for another day and still had noodles left for a pasta meal. The spices and olive oil stand ready for my next plan. reward is a simple pleasure. The six month growth of the apple through their slow maturation during a long summer can be challenged by too much heat, too little rain, harmful bugs and damaging, high winds. On a bike ride that cool, bright fall day when I rested at the picnic table under the apple trees behind the City’s Botanical Gardens, I thought how the long journey of the apples is similar to the process of food preparation and eating solo. Sometimes a meal is delightfully perfect and sometimes something unforeseen or frustrating comes up during the process. Don’t be discouraged. Don’t be overwhelmed. We have all had delicious successes and puzzling failures. Let’s take this bit by bit. The apple trees also remind me that we should start with what we know. The fruit-filled canopies of those trees brought me back to the two apple trees and two pear trees in the yard of my childhood home. We would climb up to pick fruit with a canvass pack slung over our shoulder and a long pole with a wire basket at the end to snag the apples. My Mom would can applesauce and preserve it for the winter, a soothing reminder during the frigid Wisconsin winter of those crisp fall days in the trees. My Mom is now Grandmother to 11 spirited young people, who request “Grandma’s applesauce” for every family gathering. Each individual apple is a crispy delight on its own but it couldn’t have come to fruition on that sturdy tree without the pollination of the bees, the sustenance of the rain, the nutrients from the soil, and crucially, the farmer of the orchard. There is a detailed expertise to knowing how to plant, grow and trim the trees so they bear the most beneficial fruit. That is how we are going to approach cooking for one. I will present the pieces, that all interconnect, for successful meal preparation. I’m not going to simply focus on recipes because I think the craft and finesse of eating solo is more fundamental: it’s knowing what kitchen equipment to have on hand so a meal comes together with ease; it’s building the inventory of groceries on your shelves to form the backbone of many meals; it’s knowing how to strategically shop for food including taking advantage of prepared items, in different forms; it’s eating out with confidence. So ultimately, it is knowledge of ingredients and their versatility and of fundamental preparation techniques. Start with the kinds of food you enjoy and expand from there. Whether it is tacos or pastas or stir fries that are your favorites, you can strategically shop and stock your kitchen to weave those favorite flavors into your meals. Start with the flavors you know. So when I went to the apple orchard with my 12 year old nephew and two of my sisters, I knew I would take too many apples home even though I cook for one. All we could smell while we were walking through the orchard was apples! I know that most apples store well, in the fruit drawer of the refrigerator, especially since I knew they were super fresh. On an evening when I want a simple bite, I can slice an apple and a block of Cheddar cheese and enjoy those with crackers and summer sausage. I can slice an apple into a spinach salad with cucumber, walnuts, and drizzle it with a poppy seed dressing or balsamic vinaigrette. I can add chopped apples into a grain salad like quinoa with sunflower seeds. I can dollop some of that applesauce I made, in homage to Mom, onto my instant oatmeal. Warm up the applesauce in the microwave for ten or twenty seconds and it will smell like apple pie when it hits the warm, grainy oatmeal. Lightly sprinkle the top with cinnamon or nutmeg. Herein is the process of the craft and finesse of cooking for one. Peel four apples with a vegetable peeler or paring knife. Cut apples into medium chunks. Don’t worry about the chunks being exactly the same size; they will soften as they turn into applesauce. Drop the apples into a medium sized pan with about one cup water, just enough to cover the bottom of the pan. If you plan to use the applesauce over several days, add 2 tablespoons of apple cider vinegar or lemon juice to keep the apples from browning. Turn the burner to medium heat and place pan with apples onto the burner. When you hear the water start to sizzle, stir the apples. Watch the apples to be sure there is always a slight bit of liquid on the bottom of the pan. Stir often. Turn down the heat a bit so they don’t burn. You want a small amount sizzling but not a lot. Turn the heat off when you reach the desired texture. Sometimes I like some chunks still intact or it can be cooked into a smooth sauce. Often it won’t need any sweetener, so taste and add a touch of sugar, maple syrup or honey to taste. Sprinkle with cinnamon, if you like. Scroll down to share this post or leave a comment!